I'm glad you beat the rush. :) I like coconut and the cake looks good. I'm going to keep this cake in mind if you ever want to barter for some of my vegetables this year! I love coconut cake. New Years eve and I am already talking about vegetables I am ready for spring. Boy! His office was really lucky. This cake looks wonderful. that is sort of funny, some husbands are just like that and I am a procrastinator too so kind of understand where he is coming from, it a weird affliction. Congratulations on managing to fulfil the P's request, lucky hubby and the coconut cake looks delicious. Hope you have a lovely New Year's Eve at the Two Bears Farm. Yes, I do - and that cake looks AWESOME! I am having a macaroon with chocolate today. Among other things! I LOVE coconut. Two of my children hate it, but I will devour anything with coconut like it's nobody's business. Nicely done bailing out hubby. I am the only one who likes coconut here which is a good thing--more for me. Happy 2014 to you and yours. My wish for you is a year full of lots of JOY, PEACE, LOVE and BLESSINGS. Happy New Year. By the way, I love coconut--and would love that cake. YUM. I love coconut too... this looks easy and YUMM! 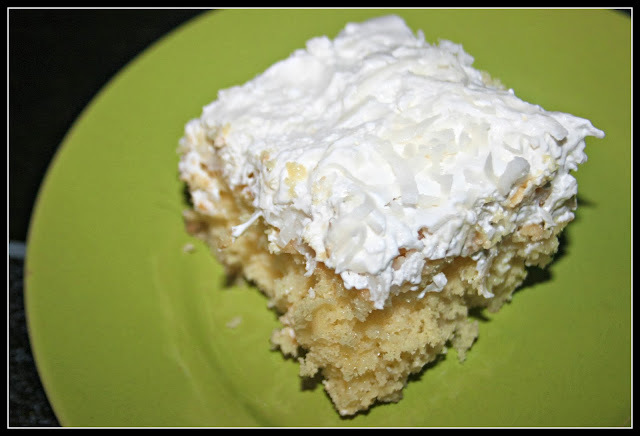 Sounds yummy, my husband loves coconut cake so I will have to try this one. I don't like the texture of shredded coconut, but I do like coconut taste. So I really like to use coconut milk in cooking (like curries) and desserts (ice cream!) even though it doesn't have a strong coconut taste. That cake sounds delicious! And easy! For some reason, the end of the year is also pretty busy here. I guess it is spending time with all the kids. What ever the reason is, your cake looks great. Forgot all about this one...It looks so yummy!! Wishing You A Wonderful New Year!! Look so delicious. I really love coconut. Thanks for sharing me your recipe. That must have felt very stressful to you. But the cakes looks very tasty. I do not eat coconut, since I am allergic to nuts. I can't even imagine how stressful. Thanks for sharing the recipe.